Summary: Florida's sea turtle nesting beaches are being put under more and more pressure as the human population in coastal cities and towns continues to grow. 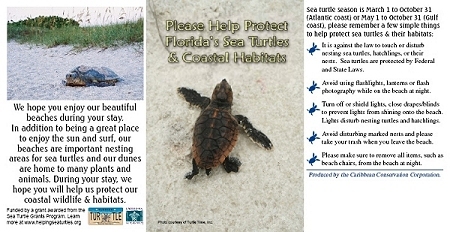 These beaches provide some of the most important nesting habitat for marine turtles in the continental United States. Inappropriate coastal development, artificial lighting and human encroachment on nesting beaches can discourage sea turtles from nesting, and it decreases nesting and hatching success. It is of critical importance that Florida's growing human population behaves in a way that minimizes impacts to sea turtles, and that all begins with education. Florida is fortunate to have a network of Marine Turtle Permit holders spread out among most of the state's nesting beaches. Most of these permit holders are individual volunteers or groups dedicated to monitoring and protecting sea turtles. Unfortunately, few of them have the time or resources to develop and print high-quality public education materials that will achieve the kind of awareness-building needed in coastal communities. To alleviate this, the Caribbean Conservation Corporation will utilize its expertise to develop and distribute a “warehouse” of high-quality, accurate sea turtle education resources that can be personalized by each participating permit holder group or coastal business.